I am a quilter - a retired woman living with my husband in the Nebraska Panhandle. We are surrounded by beautiful semi-arid ranch country, and treeless hills and fields under incredibly wide blue skies. We are located far from the upheaval found often in large towns or cities. I am blessed to have delicious time to quilt and to appreciate my peaceful moments in an unpeaceful world. I thought I'd add blocks with BLUE as the diagonal - I like it! Maybe I'll alternate the blocks - not sure yet but so far, it looks good to me. At first I found this pattern tedious until I had a duhhhh moment, and practiced webbing the block. Wow - who knew it would increase efficiency and decrease hand movements so dramatically? Of course, webbing is easier with a 9-patch than with a 36-patch but so far, so good. (note to myself ... Why do some clever techniques take me so long to adopt?) Mom always said I was stubborn. And I noticed the inspirerer (is that a word?) 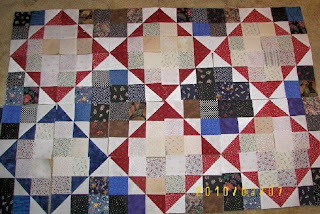 of this piece, Ms. Bonnie, (Quiltville.com) has a new project, with what appears to be the same units. And I DID manage to finish a challenge R x R block - I hope Jacci likes it! Nopers, no photo. All of them will be revealed at next Guild meeting - I cannot imagine what mine looks like. This has been fun, a stretch to our imagination and skills. What do you mean by webbing? A term I am not familiar with. I like having different colors! But what is webbing? I don't think I've ever heard the term. Ditto. That's a new term to me. Regardless, I love the blocks! I guess we are all puzzled. Do you get spiders to help you? Next post, I'll describe and post photos of "webbing". Elaine, that blue is a great addition. Good for you! A very nice tutorial on webbing the pieces in a block to make the whole process sew peaceful Thank yu. Oh so fun and scrappy! I wonder how many versions of the split 9-patch block there are? This one is new to me. I'm finally catching up on blogs. Love your posts Elaine. A Plethora of Round Robin Border Challenges! Blog hop and another Giveaway! Wherever you go, there you are. We are forever learning to adjust to inevitable changes. Enjoy each day - work some, play some. Laugh a lot!